For those who, like us, find the mountains of plastic gimmicky gifts in high streets across the land just a tad unsavoury, we’ve put together a mini-guide to little gifts with purpose. There is something for every budget and each has been carefully and lovingly created with one eye on ethics and the other on style. And, if you haven't even started your shopping, we've included last order dates for Christmas delivery and where possible, bricks and mortar stockists too. Beautiful and fresh designs with a hint of mid 20th century glamour. Each pattern offers different options - the Elisalex dress (below left) can be made with or without sleeves and the Charlotte skirt (centre) pattern gives options to add the ruffle at the waist as a peplum, at the hem, or omitted altogther for a classic pencil skirt. 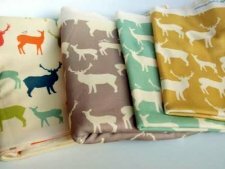 Their website cleverly offers sew a long assistance - great for the sewing novice - and pattern hacking for the more adventurous. Last order dates for Christmas Deliveries from the UK: orders made on the By Hand London site by the end of Thursday 19th will be sent out in their final post on Friday 20th. If you are UK based, order from Anthropologie by Wednesday 18th at 12pm for Standard Delivery, or by Monday 23rd at 12pm for Express Delivery. 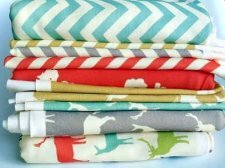 Ray Stitch have selected a gorgeous range of bright, quirky, cool, organic prints including the below Elk Grove Organic Knits by Birch Fabrics. They also offer lots of other lovely haberdashery notions, trims, buttons and patterns (including By Hand London). 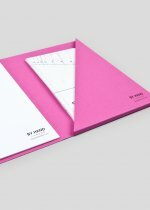 Their gift vouchers (minimum £10) can be redeemed against classes and goodies instore or online - vouchers can be purchased and downloaded until the end of day on Monday 23rd. Stockists: order online or visit the store, Ray Stitch, 99 Essex Road, London, N1 2SJ. (Last day open before Christmas is Sunday 22nd). Last order dates for Christmas Deliveries from the UK: order products or vouchers online by Friday 20th for standard first class and next day delivery. This excellent little tome by the collective's founder Sarah Corbett is bursting with practical tips and 'how tos' for those us us wishing to harness the power of craft and be empowered through "introverted activism". Craftivist Collective aims to "tackle issues of human rights, global poverty and social inequality in a provocative and thoughtful way, quietly encouraging people to engage with these issues on their own terms". 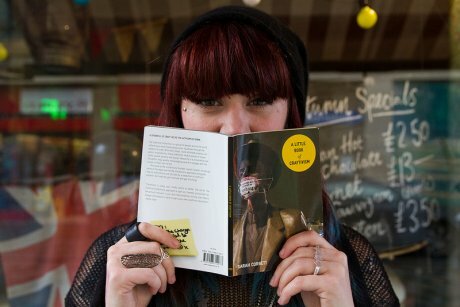 The innovative ideas include hand-stitched fabric post-it notes, pop-up craftivism and mini protest banners. Last order dates for Christmas Deliveries from the UK: order direct from Craftivist Collective on Etsy by Friday 20th to get a signed, gift-wrapped copy for £5. Other stockists above may have later 'last postage' but prices for the book will vary. These Scanfil threads are excellent quality and come in a lovely array of colours - they are perfect for machine stitching and for some of your hand-stitched Craftivist activities. 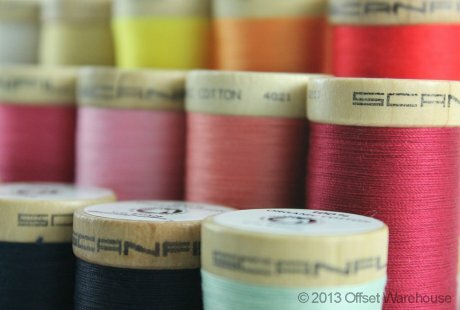 Offset Warehouse go to great efforts to offer an environmentally friendly and organic haberdashery - other items include reclaimed belt buckles, organic cotton fringing and ribbon made of cellulose instead of polyester. Their gift vouchers (minimum £15), if ordered online by midday on Tues 24th will be emailed to you to download (great for last minute gifts). As an alternative to expensive, sometimes un-wanted and wasteful Christmas presents we created a voucher for you to give as a gift, for free. You can print the voucher, fill it in and give it to a friend or family member with the promise that you will teach them to sew, knit, darn, mend, crochet or even be a craftivist! Sharing your skills and time (and a maybe a bottle of Baileys and a mince pie) with someone else really does give a rather warm glow. Plus it can help them prolong the life of their clothes and save them money too. Do let us know if you give someone the Sew It Forward voucher - we'd love to hear your stories and see your photos. We also hope you will share this link but please do ask us before publishing the voucher online or in a print publication. Last order dates for Christmas Deliveries from the UK: barring any major server failures, you will be able to download and print the voucher on Wednesday 25th and beyond - the ultimate last minute Christmas gift! Please note: the above delivery information has been supplied by the retailers or found on their stockist's website. If you do need your order in a hurry, we suggest contacting the retailer to double check they can dispatch it in time for Christmas.